A New Documentary Looks Back At A Famous Cup Of McDonald's 'Hot Coffee' Attorney and filmmaker Susan Saldoff presents an argument in Hot Coffee, a documentary that uses the famous "McDonald's coffee case" as a jumping-off point for a broader discussion of the civil justice system. The new documentary Hot Coffee presents filmmaker Susan Saladoff's impassioned arguments on four aspects of the civil justice system. Question: What do you think is the most famous lawsuit of the last 50 years that didn't involve an already-famous person? My guess is that it might be the case of Stella Liebeck. If Stella's name doesn't ring a bell, maybe "McDonald's coffee" does. 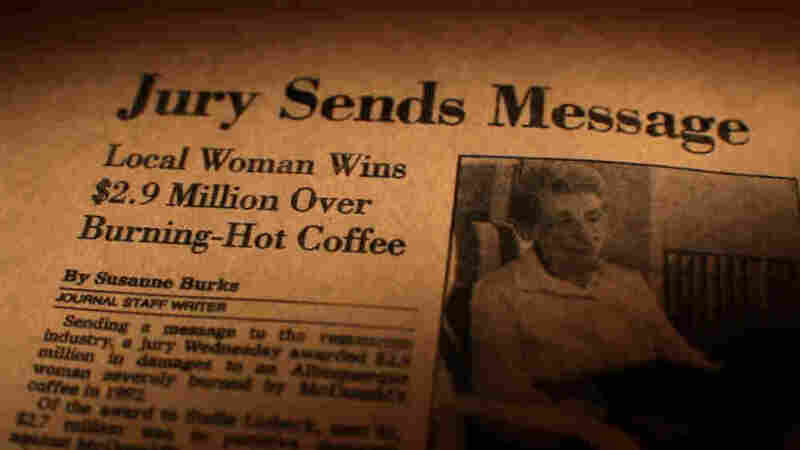 The Liebeck case became a legend largely because the narrative that became popular had three basic elements that people quite reasonably found galling in combination: (1) A trivial injury (spilling coffee on yourself); (2) resulting from a ridiculously foolish act (driving with a cup of coffee between your legs), for which (3) someone set out to get rich (the jury awarded Stella $2.9 million). Airing tonight at 9:00 p.m. on HBO, the new documentary Hot Coffee argues, among other things, that all three of those elements of the popular narrative were fundamentally false. It shows gasp-inducing photographs of Liebeck's third-degree burns, which required hospitalization and multiple skin grafts; it clarifies that she (in the passenger seat) and her grandson (in the driver's seat) were parked in the McDonald's parking lot, and were not driving, when the coffee spilled; and it extensively quotes Liebeck's attorney and family on the fact that her initial request to McDonald's was merely to have them pay the part of her out-of-pocket medical expenses that weren't covered by Medicare. There are other aspects of the Liebeck case that are explored in the film — which played at last week's Silverdocs festival in Silver Spring, Md. — including the fact that the judge reduced the award and the problems the jury had with some of the testimony McDonald's provided. But the aim of filmmaker Susan Saladoff is, at least in part, to offer a counterargument to a narrative she believes has fundamentally changed the way people perceive the civil justice system, in spite of the fact that it isn't what actually happened. Understand: Saladoff is an advocate, and she was, when she presented the film at Silverdocs, clear and unapologetic about the fact that Hot Coffee is an opinionated argument, not a dispassionate recitation of facts. She's trained as a litigator herself, and she's angry about the four topics she tackles here: false (or partly false, or exaggerated) narratives about particular lawsuits, legislative caps on the damages an injured person can collect notwithstanding the extent of the injury, the influencing of judicial elections in order to have those legislative caps upheld in court, and the use of mandatory arbitration in consumer and employment contracts. There are a lot of pieces to the Liebeck case alone, and the misunderstandings of the facts are not all there is to it. Not everyone who fully understands the facts of the case agrees that she should have recovered anything — some judges have thrown out similar cases, and some juries haven't awarded damages in similar cases. But it is true that seeing the film makes the case look different than it does if you are under the impression she was flying down the highway with a teetering cup of coffee in her lap. Showing the pictures of Liebeck's burns doesn't suddenly resolve all debate over the case. But if people are going to have strong opinions about whether she should have collected anything and what that means about how courts work (which many people do), at least Hot Coffee gives them an opportunity to base those opinions on the original story, rather than on jokes from Seinfeld, which can happen when a case becomes such a fable that the perception of it is based on the equivalent of tenth-generation photocopies of what actually happened. Saladoff told the Silverdocs audience of Hot Coffee, "It's my truth." Indeed, there are other people who undoubtedly would (and do) make other arguments from the same sets of facts. But when the maker of a documentary is straightforward about the fact that she's staking out a position, it's kind of refreshing: When you know that, you don't walk out of the theater thinking you've supposedly been presented with every argument. This is just her argument, and she offers her evidence to support it. What you do with it, and the degree to which you are persuaded, is up to you.